6:50:00 PM Depends on what you're going for, the webmaster is definetley a better tanker. 4:26:00 PM You know what i'm going after another one of these but i'm waiting till i master so if i run into a widow i can handle her. I'd hate to see one and be able to do nothing about it. 1:17:00 PM Got one of these last night - this is my highest tamed pet to date....cannot wait to complete my stable. 7:55:00 AM I just caught my first Webmaster baby last night. My Delirious Merek Avenger attacked the baby, and I had to burst run away telling it to follow. Finally I got the aggro to stop and was able to run back and tame the baby. I would have felt bad if my merek would have eaten the baby. About 30 minutes after I caught my baby, a guildie that gave up CH gave me one he had in his datapad. So now I have 2 of them. Now to come up with names for them. 5:53:00 PM Hazar, the poison, disease, and knockdown specials do not work on command. Exceptions are Poison Spray and Plague Strike. 11:05:00 PM Special attacks like poisen and disease do not display when U give the command. Success depends on the targets resistance. 3:12:00 AM Baby rarity rating 5, there seems so be a static spawn in the area of 3780 -5379 on Gorath. Tamed three of them lil buggers in two days. Not to speak of the massive amount of arachne warrior babies hanging out there. 8:03:00 PM I've tamed a bunch of these, and they seem to be a favorite for those not wanting to spend 100k on a bio-engineered pet. Aside from the frenzied graul, this is probably one of the best natural pet that's tamable. 3:38:00 AM very easy to tame with alomnd kwevv crisp. Took me 2nd try to tame even thought was attacked by merek. 7:08:00 PM yes they are very tamable and no longer considered rare... sigh at one point they were on the extinct listing for babies. in 3 days time i've seen 3 caught 2. 9:55:00 AM Ignore Seakyale's comment. 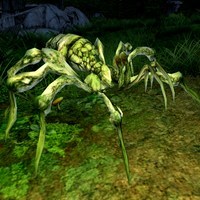 I've tamed dozens of these since the patch. 7:08:00 PM I just tamed 2 webmaster babies lev 50 stun strike and strong poison as special attacks, max damage 520, light armor smuggler outpost, endor. grinsss.. yes they are very tamable. 5:49:00 PM Although these produce babies they are not tameable!! !